Kubo and the Two Strings is a children’s film that knows we never stop being children. This is especially true when we are at the feet of a great storyteller. It doesn’t matter how old you are. If you are there listening to the tale, you must turn off the chatter in your head in your soul, inch closer to the fire, and pay very close attention. In the first words of 2016’s best animated film, the young Kubo urgently instructs the viewer, “If you must blink, do it now.” For if we let our attention flag for even a second, the hero of this adventure “will surely perish.” Kubo says from the very beginning that the reader, the listener, the viewer are a part of the storytelling process, and the act of listening to the story and and learning from it is a central part of what narrative is all about. Kubo may be a modern animated film, but it shrewdly takes the form of a kind of ancient fable, as if its thrills, twists, and mythic battles had been the stuff of folklore for generations. It acts as if its wisdom had already been passed down through centuries of oral tradition, and in a sense that is true. It is true because, fundamentally, Kubo’s moral is that it is vital, and has always been vital, for human beings to tell each other stories. The art of storytelling has been one of the cornerstones of human development for thousands of years. Stories about how past generations hunted or farmed or built shelters helped us expand the reach of civilization. Familial histories gave children a sense of those who had come before them. And, as our minds expanded, we used stories to help theorize what might lay beyond our sight. Beyond the sky and beyond the barrier of death. Kubo and the Two Strings is the year’s most beautiful animated film and also one of the best about how human beings tell stories to make sense of an inscrutable world. It is the story of a nine-year old boy who tells stories for a living and how those stories help him cope with loss and mortality. Kubo is another fine work from the very talented animators at Laika studios. Their films consistently show an affinity for children grappling with mortality, fear of the unknown, and the border between childhood and adulthood. We first meet Kubo as an infant in the film’s breathtaking opening. His mother is desperately trying to shepherd her son to safety across an angry sea in a small wooden boat. Hundred-foot waves threaten to dash their craft to pieces, but she is able to dispel them with notes from a magical stringed instrument. They make it to the shores, but not before the storm throws the boat onto the rocks and causes Kubo’s mother to suffer a debilitating head wound, which robs her of much of her memory. The two are running from Kubo’s aunts and his grandfather, the Moon King, who rules the Heavens. Kubo’s mother was once a deity, but gave up immortality for the love of Kubo’s father, a mortal samurai who was slain by the vindictive Moon King. Kubo never met his father. We also learn that the Moon King managed to steal one of Kubo’s eyes. He is now a nine-year old boy living in a mountain cave above an ancient Japanese fishing village. Kubo (voiced by Art Parkinson, who subtly plays him as an intelligent, observant boy, while still retaining the innocence and inexperience of youth) begins each morning by feeding his disabled mother, who can no longer take care of herself or speak during the day. He spends his days down in the marketplace telling stories to the villagers. As a result of being half-deity, Kubo can puppeteer elaborate origami figures by strumming his magical, titular, two-stringed instrument. He returns home every day before sundown to greet his mother, who regains some of her faculties at night. She still has difficulty, however, remembering all the details of her past and she can only give Kubo a vague impression of the father he never knew. The most important story she tells him is of his grandfather and wicked aunts, who are always hunting for them in the hopes of stealing Kubo’s other eye. She tells him that he must never stay out past sundown, when the moon will be in the sky. She also reminds him to keep two possessions with him at all times: a small wooden charm in the shape of a monkey and his father’s old robe, which has the shape of a beetle on the back. One day, Kubo wakes up to find that the village is celebrating its annual festival to honor the dead. The villagers make lanterns that they believe allow them to talk to the souls of their departed loved ones. Kubo is so moved by a desire to speak to his father that he stays later than normal to make a lantern and ends up out past sundown. As a result, Kubo’s malevolent aunts find him and almost catch him. He is only able to escape through his mother’s intervention, but she ends up giving her life and soul to buy him time. She conjures a pair of wings on his back, which fly him to a faraway part of the country. Kubo wakes up in a snowy wasteland with a full-sized monkey looking over him. Monkey (voiced with a beautiful blend of toughness and sensitivity by Charlize Theron, who also voices Kubo’s mother) is Kubo’s wooden charm come to life, and she tells him that his mother poured the last of her magical life force into her so that she may protect him. Monkey informs Kubo that he must find three sacred objects that made up his father’s armor, in order to have a chance of defeating his grandfather and aunts. They are also joined by Kubo’s tiny origami samurai, who comes to life with compass-like powers, and later by a samurai who is half-man and half-beetle. The samurai, who simply goes by Beetle, can remember nothing, but feels sure that he was once a warrior loyal to Kubo’s father. Kubo has much in common with a great many stories of unlikely allies questing to find sacred relics, but it exudes a sweetness and a sad acceptance of death that very few such quest tales have. It is the story of how stories of our loved ones help us survive, make us who we are, and connect us to our past. In searching for these objects that belong to his father, Kubo also comes to learn about his family and finds that people leave traces of themselves in the narratives and possessions they leave behind. 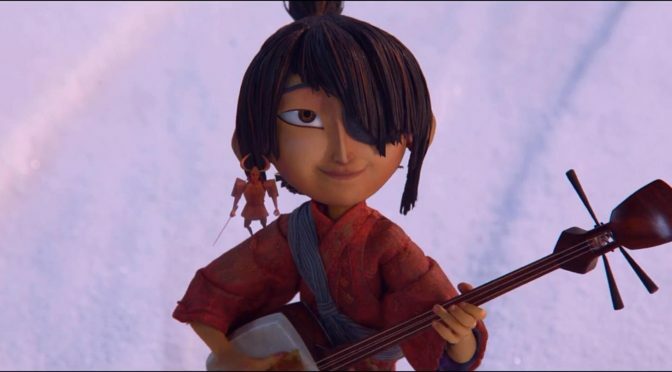 One of the most refreshing and lovely qualities of Kubo and the Two Strings is that it speaks to children in a soft but firm tone about the idea of death and loss. Even if this were not one of the most gorgeously visualized animated films of recent years, it would still be fit to stand with films like Bambi, The Lion King, and Finding Nemo because of how directly it looks at the grief of not knowing if you will see a loved one again. Like those other great animated films, Kubo is soothing and sympathetic but also bruisingly honest. Kubo can take solace in the fact that his mother’s magic rests in Monkey and he can find a strong, compassionate male figure in Beetle, but the film also knows that having the essence of a lost parent is different from really having your mother and father in front of you. The stories of those we lose are a salve for our pain and they help us feel a spiritual bond to them, but stories do not erase the notion of loss and death. What they can do is write our love for one another in great, bold letters. This is why Kubo is willing to risk his own life to go to the festival in the first place. Even if it is only a ritual, that yearning, soul-filling act of telling a story to a departed loved one is powerful and worthwhile. For Kubo, telling a story to the father he lost is an act of love more powerful than death. This is one of Kubo’s most important overarching themes and its final thoughts on the matter of death and storytelling lead to one of the most ecstatically poignant, heartbreakingly true endings in any film this year. And it makes abundant sense that a film so sweetly honest about dying should have one of the year’s most powerful endings. Because Kubo and the Two Strings is a film all about the inevitability of endings. It is about the hurt of knowing we must all say goodbye and the solace we can find in telling someone’s story all over again once they are gone. Kubo is simply one of the most emotionally healthy films about bereavement I have ever seen. And, even more than classics like Bambi, The Lion King, and Finding Nemo, the film is intently focused on the hardship and the unexpected beauty that comes from grieving for another person. Grieving were huge parts of those other films, but they are the focus of Kubo and I find it invaluable and refreshing to have a film that takes on that issue. For children and for everyone else too. It does not peddle in easy answers and it does not presume to know what lies beyond death. For all the film’s use of magic and all its mythical lore, the final question of what comes after our last breath remains hidden away. Kubo has no problem including a magical instrument that can puppeteer origami figures, a child who is half-god, a powerful lunar deity, a wooden charm come to life, a giant beetle with a samurai’s soul, and numerous fantastical monsters to battle. This is all in the game of storytelling. But Kubo and the Two Strings refuses to disrespect the children, of all ages, listening earnestly at its feet, by telling them it knows what happens when this life is over. What it will do is hug you tightly and tell you to find comfort in the memories of love once shared. Along with storytelling, memory is the tonic Kubo prescribes to help us process mortality and the unknown. The point of each magical object, be it a mother’s charm or a father’s robe, is not to suggest a world where magic can “cure” mortality, but one where treasured objects can offer a balm for our cuts. Inside Kubo’s scintillating modern technology is an old fable that tells us we can find comfort in any old relic; anything that stokes our memories of each other and of the love we shared. Monkey, herself an old memento, makes Kubo a bracelet out of his mother’s hair and tells him to keep it with him. It is a memory, she tells him, “and memories are powerful things. What makes Kubo the most splendid animated offering of 2016 is not just its beautiful, hauntingly human story, but the fact that Laika Studios do what is perhaps their best work to date in order to bring it all to life. At the very least, Kubo and the Two Strings stands with the studio’s 2008 masterwork, Coraline, in the way it conceives a striking, surreal world of magic and places a smart, inquisitive child in the midst of it. And as with Coraline, this world is not just visually astounding but totally of a piece with the story the film is trying to tell. I regard Henry Selick as the master of stop motion and I have no interest in saying that Kubo “beats” the visuals of Selick beauties like Coraline and The Nightmare Before Christmas. However, I will say this: this is the most seamlessly beautiful stop motion I have ever seen. The film has a sumptuous array of textures from the delicately sharp creases of Kubo’s origami figures to the pale porcelain of the gaunt masks Kubo’s aunts wear to the glassy serenity of the lakes and rivers. Monkey’s fur is made entirely out of tiny strips of white paper that rustle in the wind. I understand that some of Kubo‘s visual splendor was achieved through robotics, 3D printing and a bit of CGI, but I frankly do not care. I have zero interest in being a purist about this. Kubo and the Two Strings is too ravishing and too luminous a work of stop motion animation to be dismissed. If a stop motion film can look like this, it shows that the medium is still growing and evolving, and that is everything a lover of this increasingly niche form of animation could want to hear. Kubo is meant to feel like a fable from ancient Japan and that requires a mixture of both realistic natural landscapes and the ghostly, glowing textures of skeleton monsters and moon gods. Like a bedtime story or one of Miyazaki’s films, Kubo needed to feel like it was set in a recognizable (albeit ancient) human world that also shared a permeable border with the realm of spirits and magic. It succeeds beyond its wildest imagination in nailing that subtle blend of tones. It conjures a world that is alternatingly shimmering and spooky. Kubo and the Two Strings is finally a story about how stories make us human and it radiates a palpable love for humanity. After all, it is the tale of a goddess who abandoned heavenly perfection for the beautiful, aching mess of humanity. When the Moon King urges his grandson to finally join his celestial kingdom and leave the imperfect mortal realm behind, he tells him that he will be “beyond stories”. Whatever we think of the afterlife or God (or the gods), there is something bittersweet in the idea that we would ever lose the need for narrative. Kubo says there is something perfect and complete just in the brief, sometimes painful lives we share together here on Earth. Maybe death really will bring us to a place where we understand everything and where we no longer need to cobble together these fragile scraps of fiction and lore to make sense of it all. But for myself, and any person still living, that state of confusion is the very essence of what it is to be human. Film, art, music, and writing are all the result of our feeble attempts to explain something to one another or to ourselves, and I cannot imagine wanting to be beyond any of them. Human beings render such brilliant gold out of the flax of their fears and doubts that I have to think it would at least give the beauty of the hereafter a run for its money. Then again, we are bewildered mounds of flesh, so maybe the most beautiful of our literature is nothing more than a cardboard nursery book in Heaven’s waiting room. Still, from the time I’ve been here those stories have meant the world to me. Whatever grand cosmic plan waits for me when I die, I pray I never forget that my first redemption came from the words of fellow human beings, living and deceased. They were my friends. They were my teachers. They were Seuss and Alcott and Eliot. Kubrick and Spielberg and Linklater. They were my mother and my father. They saw I was afraid and could not sleep. And they told me a story.